Taking care of outpatients, lots of them, is the focus for this 30-year radiology veteran who is the vice president and medical director for the East Region of the largest provider of free-standing, fixed-site outpatient imaging services in the U.S., RadNet. Their 500-plus radiologists at 298 owned or operated outpatient imaging centers read more than 7 million scans a year—so Tanenbaum sees great value in facilitating those reads and strengthening the fabric of radiology. A radiologist with a ruler is not delivering maximum value, he jokes. We need to leverage advanced technology and greater knowledge to deliver the critical information which sets the next step in the diagnostic or treatment pathway. Gains will come too in operational and financial advantages efficiencies. Think better asset and staff utilization and effective billing by determining which claims will be rejected. Algorithms will determine the best deployment of assets, such as where a ultrasound system should be located, and offer recommendations on the likelihood of a patient’s readmission to a hospital or developing complications or certain diseases. Revolutionary will be AI’s ability to change the amount of scan time necessary to create an MR image, for example, or the amount of contrast for contrast-enhanced imaging. “We’re going to see the next generation of noise reduction in CT that’s going to be more clever and allow even greater dose reduction. We’re going to see smarter tools like reconstructions that will recognize motion.” He also points to the ability to diagnose lung cancer multiple visits before a radiologist can detect it visually or detect fractures, hemorrhage, stroke or pneumonia and bring those cases to the top of the worklist. 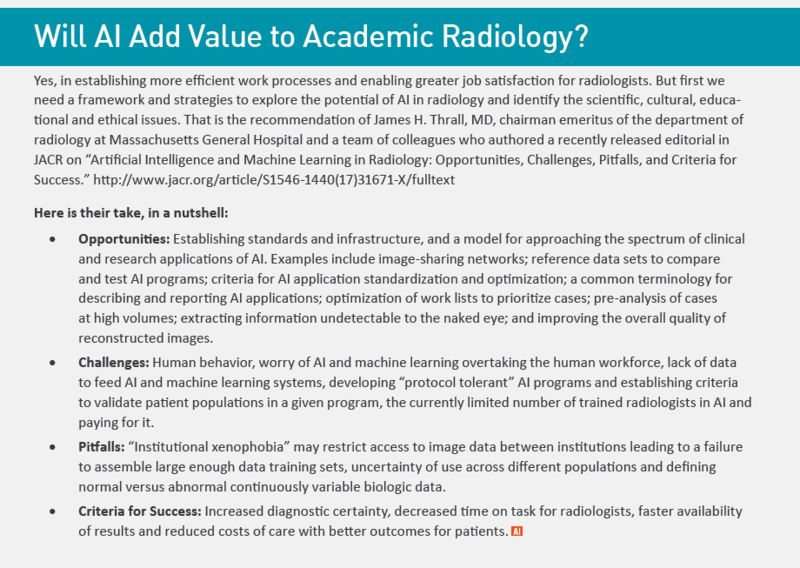 It is said that “radiologists will not be replaced by AI, but radiologists who don’t use machine learning techniques will be replaced by those who do.” In reality, Tanenbaum expects AI capabilities to ultimately integrate seamlessly into the radiologist’s user interface and thus be unavoidable as we move forward.